What price for a cycleway? 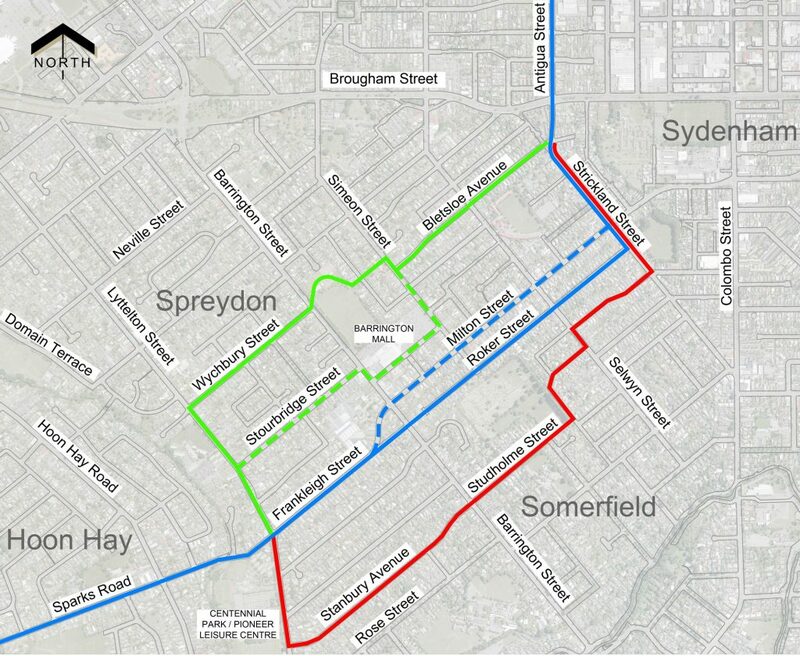 One of the more contentious issues recently regarding Christchurch’s Major Cycleways revolved around the proposal to purchase two properties in Somerfield to create a new link between Roker and Barrington Streets as part of the Quarryman’s Trail cycleway. This option allows a quiet street route for the cycleway rather than the original concept for a separated cycleway along busier Milton St, which would have eliminated much of the on-street parking there as well. 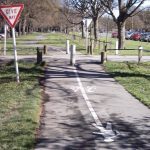 Cycleway desire lines – do we go through here? The owner of three of the units potentially in the firing line was profiled as she would have to move from her long-time home. There was a back story about her grieving over the death six months ago of her mother (who lived in one of the other units) and Council sending her deceased mother letters about the proposal. Sorry, but communication mishaps like that happen; had the property details been updated at Council? People have asked why carparks are being prioritised over houses, evidently demonstrating a lack of spine by the City Council. I’m impressed (if a little suspicious) that suddenly so many commentators have realised that car parking isn’t the be-all and end-all to city life. I’d actually call it pragmatism on the part of Council; they’re already buying a fight by removing enough carparks on other parts of the Quarrymans Trail (and have encountered similar opposition elsewhere in the city); here was an opportunity to come up with a solution that didn’t remove carparks and was just as direct (and probably more pleasant for cycling). The extra saving of not building a separated cycleway on Milton St (instead of a greenway treatment on Roker St) more than offsets the property purchase costs too. 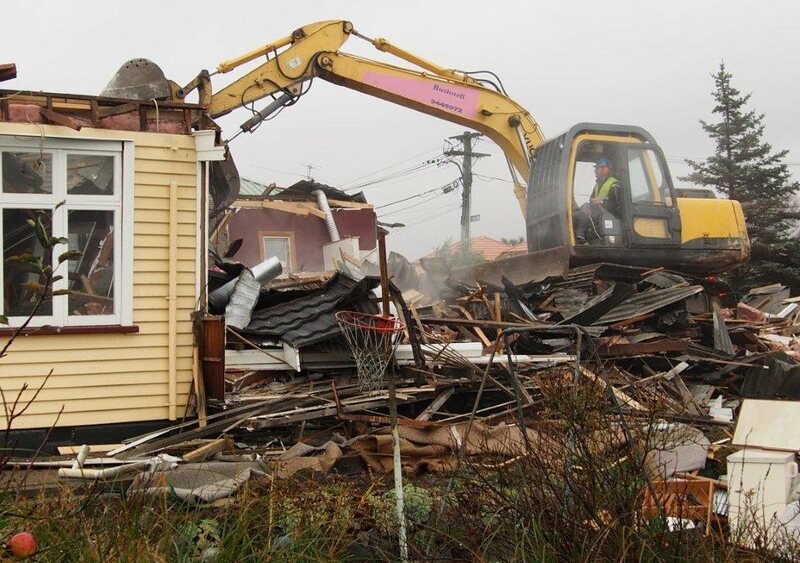 A number of public comments have suggested that demolishing two houses seems crazy when Christchurch has “a housing shortage.” I think they’ve been watching too many news articles about Auckland; post-quake Christchurch did have a housing squeeze when we needed places to hold all the displaced families while their houses were being repaired and also the rebuild workers. Now, apparently landlords are finding it a struggle to attract tenants, and property prices here have flatlined. In the bigger scheme of things too, two houses are not going to influence Christchurch housing supply either (and maybe some smaller units could be rebuilt on the land left over after the cycleway construction). There have been suggestions that quiet Roker St will be “turned into a thoroughfare”, with “concerns about the extent of parking loss and the effect on quiet streets.” Um, it’s a neighbourhood greenway, folks; I think some are confusing the pictures of the separated cycleways along other parts of the route. There will be no extra motor traffic, negligible parking loss (a couple of traffic calming devices only?) and I’m not sure how a bunch of extra people cycling will greatly change the quiet ambience of the street. Let’s not forget too that Roker St residents will benefit from a handy new walking/cycling link to shops, bus stops, etc as well as direct access to the cycleway route themselves. 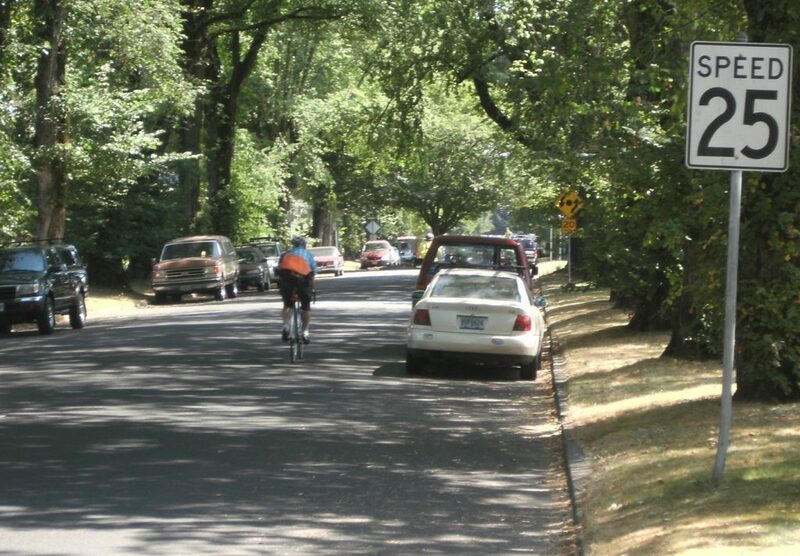 Does this look like a terrible cycleway to live next to? The general tenor of the saga suggests that people will be getting turfed out of their homes before they know it: “I’m in a really bad situation. I’m putting people on the street. That’s horrible.” We’re talking about a cycleway that probably won’t start construction until next spring – nine months away, plenty of time to make other arrangements. Most normal tenancy agreements only require three months notice. There almost seems to be some conspiracy implied by the fact that no-one knows which properties are being purchased yet – what’s the City Council not telling us? Last time I checked though, most property purchases were a confidential arrangement between buyer and seller; why would these ones be any different? Similarly, the owners won’t get financially stiffed from the exercise; typically in a situation like this people are handsomely compensated for more than market value to mitigate for the disruption; it is only if someone digs in their heels that Council might have to invoke the Public Works Act. I’ve had people ask me “well, what if it was your house?” Ironically I used to live only about 15 houses away from the area of interest on Barrington St. Of course, it’s all hypothetical until it actually happens but, if someone was going to compensate me well enough to easily find another place to live, cover my moving and other costs and then some, I think I could happily see the greater good. The Press’s editorial “Christchurch cycleways worth supporting but compulsory demolition a step too far” seems to sum up the underlying mantra: of course we support cycleways, but they’re not so important that we should purchase land for, especially where actual people live… This seems to forget a key reason why we are investing so heavily in cycleways – the road safety and physical inactivity concerns that are shortening the lives of so many Christchurch residents. Is that important enough? Is it too much to expect to purchase properties to make better cycleways? Nice work finding the old photo of the Southern Motorway onramp. That would have been about 2003 ? The construction project started in 2010, and I can’t recall whether the house demolitions and overbridge embankment pre-loading was part of that or earlier. So it is likely to be late 2000s at the earliest. I also wonder whether it would be possible to rebuild some sort of housing in a different configuration once the cycle way has been constructed. Both the sections under the red line are about 26 metres wide. That’s not true of the Roker St property, it’s probably 12 at best across the widest part. It’s hard to see on the map because there are 2 units joined together and council is only interested in purchasing 1 at this stage. NIMBYism and The Press working together to thwart progress. Local do gooder group ICECycles recently gave away our 1,000th bicycle. The Press suggested we write an article to share the good news. They then found us not newsworthy. Stirring up negative emotions sells more papers than sharing success stories? When I was 14, the Government bought our house to build a new police station for our town. My parents were well compensated, and we moved to a newer house a little further out of the CBD. That was in 1963. These things happen in cities, nothing stays the same for ever. Extreme I know, but sometimes you need to make a stand. With regret, as of today our subscription is cancelled indefinitely. The back of the camel has broken. Your editorial of Friday 16th Dec has provoked an anger in me that I have not felt for a long time. Are you not aware that safety on the roads for people riding bikes is in part compromised by the anger that motorists exhibit. It is such opinion pieces published this morning that fuels that anger . I am not going to relate to you the long list of benefits to our city and the people and live in it if more people rode bikes because I am aware that you are an intelligent person and will know that already. Have you ever driven into a car park for a shopping mall and considered how many houses were removed so you could have the convenience of parking your vehicle and leaving it there free of charge for an hour or two? Have you considered that every time you have driven down a widened road and enjoyed being able to travel faster than the 50kph speed limit that this was made possible because a nearby resident had forfeited their front garden, just for your privilege? 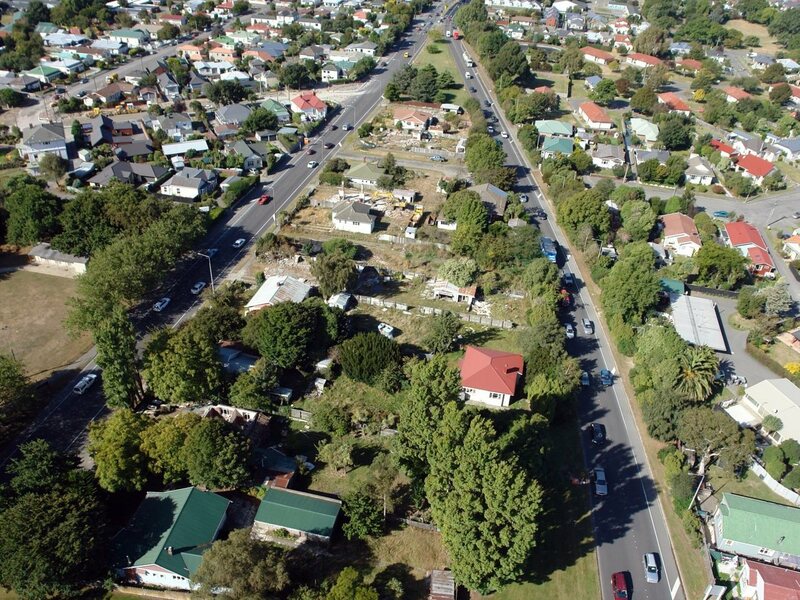 Have you enjoyed a free turn at a major intersection in our city and happened to notice that the houses on that intersection all seemed to have high fences and the sections were no longer square, with pleasant gardens and children play area long removed? Did you consider those people when the notice of acquisition arrived in their letter box , and then write an editorial about how people should come before cars and road widening ? I have had a long and interesting relationship with the Press over the years and will miss it. I wish you well in your campaign for the continued asphalting of our beautiful city and the continued promotion of hatred towards those choose a transport option so as to reduce such damage, simply to be able sell a newspaper. It is no longer for me. Well thought out discussion – oh how i wish the Press would publish the discussion as you have done – but, hey, that wouldn’t get their click-bait numbers up. It also is amazing to me how many people see car driving infrastructure as highly important but not interested in supporting cycling to the same level. And still so many suburbs could have put cycle ways through at the time of construction if only the council had just made it a necessity to leave a strip of land for that but they still don’t do it. 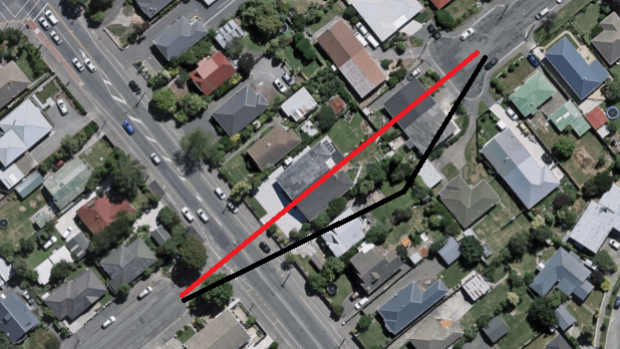 I look at the suburbs like Prestons to Waitakiri and wonder why these can be traversed via a walk through – which means there is no access to bottle lake for walkers or cyclists directly – madness. I think the real shame is that, in the midst of the fight about houses and car parks, the nicest proposed route has been overlooked. The solid green line on the map goes down wide, reasonably empty streets and through Barrington park – which would have been lovely. However, Wychbury st and Bletsoe ave would have required upgrades at the same time – making that route apparently less affordable. It seems like a false economy, those street will eventually need upgrading anyway (they have the old style drains) this would have been a good time to make a great improvement to two streets – adding trees etc – instead of removing trees along the proposed route and upsetting people with talk of knocking down houses and removing car parks outside businesses. There’s no doubting that having to move from a treasured home and neighbourhood may be distressing for those involved. There should be no minimising that, but sometimes decisions have to be made in the interests of the greater good and the individual cost can’t be avoided. The key point is the lack of equivalent outrage at motorway demolitions which cause many more individual cases than these. These are seen as inevitable ‘progress’ which could be completely avoided in many cases with proper alternative transport – cycleways and rail. People seem to forget that every bike on a cycleway is a car off the road and is a tiny fraction of the cost of expanding road capacity. It appears we are a city that has fully embraced the car and any alternative narratives are strongly resisted.